Wendy Ward recently released her third book – A Beginner’s Guide to Sewing with Knitted Fabrics. I was really impressed with all of the reviews that I had read, and was overjoyed to win myself a copy as a competition prize ran by the lovely guys at Girl Charlee UK. The book contains the pattern pieces to make 20 versions of six basic patterns. There are three pages of pattern sheets, and you need to trace off the specific pattern pieces you require as the colour coded patterns overlap and are printed on both sides of the sheets. On page 23 of the book there is a helpful guide to using the paper patterns including a check list to make sure that you know all the pieces that you need for your chosen project. The moment I saw the book, I was really interested in the blue and white striped t-shirt dress that is shown on the cover. 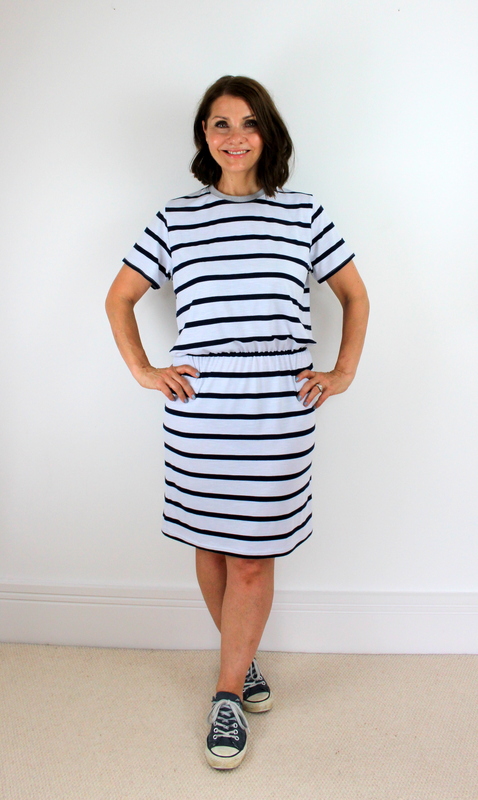 One of my favourite Summer dresses is a very old blue and white striped ‘ready to wear’ t-shirt dress which has an elasticated waist just like this. It is now sadly too big for me since I have lost a little weight since I bought it, and anyhow I have worn it so often it is pretty much worn out. This cover dress was always going to be my first make from this book, and I really wanted to get one sewn up so that I could enjoy it this as soon as possible. The Peak T-shirt is a basic crew neck t-shirt, and you lengthen it to make it into a dress. To do this, Wendy tells you that you need to extend the t-shirt pattern body pieces by 40cm. No problems with this. You effectively then have a long t-shirt which you will gather at the waist with elastic. The old RTW dress that I mentioned earlier had a bright yellow waistband, this is one of the things I loved about it most. The dress that I was making from this book doesn’t have a separate waistband piece, but I decided that I could introduce a contrasting piece of plain jersey on the neck band piece instead. I might add a coloured waistband piece in a future make, as this would be quite simple and a way to re-create my beloved dress exactly! I really would have liked to have used a plain primary colour, but didn’t have any scraps of this in my stash – what I did have was a tiny piece of leftover plain grey interlock jersey from Fabworks Online. I had used this back in April, to make up some baby sleepsuits (which I don’t think I ever blogged about) but if you head on over to my Instagram you will find them back in April. I wasn’t sure that this was going to work, as the striped fabric and the grey fabric felt like that they weren’t the same weight, but having decided that even if it meant unpicking it if it didn’t work, it would be worth a try. Surprisingly, the neckband went in lovely, and lays nice and flat. I was so pleased, and love the little pop of colour that it gives to the garment. By the way, the striped fabric is just some cheap t-shirt weight jersey bought from Leicester market for £1 per metre! Although a smidge lightweight for this project , it’s a surprisingly nice quality and has a lovely slub texture to it which you might be able to make out in some of the images. I chose the short sleeves, as this is a Summer dress, but there is the option to use long sleeves and you can add a cuff to these too if you like. Attaching the elastic, gave me all sorts of headaches! For some reason I always seem to struggle when attaching regular elastic to garments in this manner. It should be so easy – simply measure the elastic to fit your waist, join the ends to make a loop and add it to the skirt, using a zig zag stitch stretching the elastic as you go using 4 measured points on the elastic matching up to four points on the dress. I have no problems when doing this with clear elastic, but for some reason when using regular elastic (this pattern calls for 1cm wide regular elastic), it just doesn’t seem to form a neat gather when I release the stretched elastic after stitching. It kind of stays stretched in some areas? Anyhow, I unpicked the first effort, and the second time it was much better, but still not perfect. Rather than unpicking it again, and risk damaging the dress, I will settle for this, but might use my favourite clear elastic next time. By the way, this is just a technique I need to perfect, not a fault with the pattern at all! Another tip which I really should have used would be to use a walking foot (if you have one) when sewing knits – especially those with stripes. For some unknown reason, I didn’t use mine, and despite using an obscene amount of pins when sewing the side seams, the stripes have slipped a little when sewing up and unfortunately are not quite perfectly matched. There was no way I was going to do any more unpicking on this dress so I am going to ignore this little detail and hope no-one notices… ssshhhhh! So, lessons have been learned, and I basically need to slow down and take my time to avoid unnecessary mistakes. I will be making LOTS more of these dresses, they are just lovely. The basic t-shirt pattern is also something I will give a go. There are plenty of other great projects in the book, I really like the look of the Monsal lounge pants too – the perfect tapered leg cuffed jersey trousers. Who doesn’t love a bit of lounge wear? Look forward to whipping a pair of these up during the Autumn. I am also over the moon that, in my quest to sew nine patterns from independent sewing pattern designers that I have never used before as part of my #2018makenine sewing challenge to myself, this is now the 8th garment that I have completed! Whoopeee! 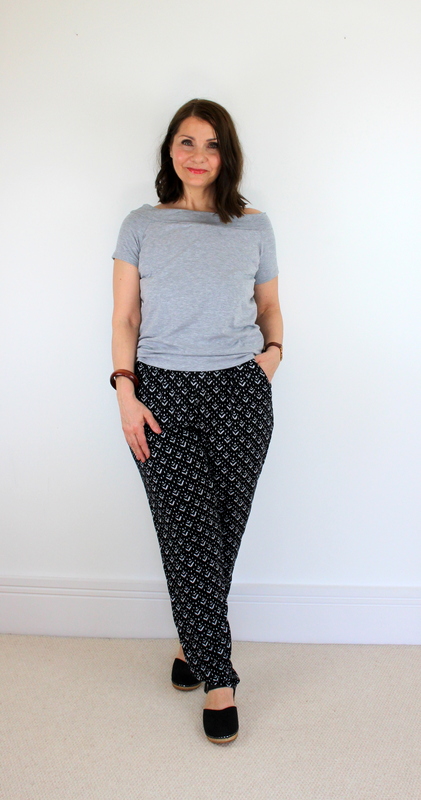 My #sewmystyle2018 April entry – the Marigold trousers from Tilly and the Buttons. So this blog post contains something completely different from me -trousers! The #sewmystyle2018 challenge is run by Jessica and it encourages you to make 12 garments in 12 months. Of course you don’t have to make all of them – I personally am dipping in and out of this challenge only choosing the items that I feel will wear often. This months make is the Marigold jumpsuit and trousers pattern from Tilly and the Buttons. I never make trousers, so why not do something about this and these do look super cute and comfy for Summer. I can’t be doing with the whole stripping off to visit the toilet situation that you get with a jumpsuit! I wondered if getting the fit of the trousers right would be tricky, so made up a toile first and was really glad that I did as I found that the crotch sat really low on me and I needed to raise this by 2″ to ensure a better fit. There is a great piece on how to fit your Marigold trousers on the Tilly website here. Don’t forget that if you are raising your crotch height like me (using the adjustment lines on the pattern) that you need to shorten your pocket pieces by the same amount. I did wonder if I should shorten the length of the legs too but I like the way they settle around my ankles so left them as they were. The trousers have a peg shaped leg tapering in to the ankles, and I am pleasantly surprised with how much I like how they have turned out. They have a gathered waist all the way around and are also shaped with small pleats and darts at the waist front and back. I think I quite like them! I am a huge fan of Tilly patterns and this did not disappoint. The fabric that I chose to make up this version in is a black geometric print viscose from Minerva Crafts. It was a very reasonable £4.99 per metre and I think it is perfect for these Marigolds. I did have my concerns that the elasticated waist all the way around would look unflattering on my shape, but I don’t feel this to be the case. I also really like the deep pockets. Essential. So all in all I am really chuffed with them. I think you may have to choose your fabric wisely so as not to look like you have stepped out in your pyjamas, but I really love this black and white geometric print – they remind me on the time that I used to work for Monsoon/Accessorize and I wore these type of trousers alot during the Summer as my work uniform. Do head on over to Instagram and check out the hashtag #sewmystyle2018 and #sewmystyle for more Marigold inspiration this month. Today I am so happy to share with you another pattern testing project that I have been working on with Kommatia Patterns. Today is launch day, and you can find the pattern available to purchase in PDF format here.. It is available in sizes XS – XL. It’s the DR308 – Cami Slip Dress and it is a knee length Summer dress with a cocoon silhouette. It calls for a silky draping fabric such as crepe, challis or silk, and it also has adjustable straps which need bra rings and sliders. The pattern is rated as an intermediate project, and this may be because the recommended fabrics are slippery and can be tricky to handle. A slim, sharp Microtex needle is suggested to help sew this type of fabric. My fabric choice is a viscose challis from Stuart’s Fabrics on Leicester Market, it’s really pretty and has a Liberty feel to it I think! I have sewn Kommatia patterns before and find their instructions to be thorough and easy to understand. This is a quick pattern to sew and only needs 1.25m or 1.5yds of fabric. Kommatia are a Canadian company so instructions are in English and French. The step by step written instructions are also backed up by drawings of each stage which I found really helpful. The back of the dress is where it’s all happening! Slim shoulder straps are adjusted by using bra rings and sliders. This is the first time I have used these and love them! Apart from being entirely practical in that you can achieve the perfect strap length, I think they give such a professional finish to the dress. The narrow width of the straps are a little fiddly to turn ‘right side out’, but I have a ‘loop turner’ which definitely made this job quicker. If you don’t own a loop turner Kommatia have helpful written instructions to guide you through this stage using a needle and thread! The back of the dress also has a horizontal strap running across the top of a v-back which is practical and pretty. It also has a slit at the centre back hem for ease of movement. Cute. The dress that I am showing you is my final pattern testing version. Although there have been a couple of ‘tweaks’ made to the pattern since I made this, I feel they are so small that you can still get a great idea of what the pattern is from this version. I will definitely be making another, so of course will share with you when I do. I should mention that it comes together really quickly, an easy dress to make in a day. I look forward to more pattern testing with Kommatia in the future, and when I do – you will be sure to hear about it! You might also wish to take a look over at my fellow pattern testers Instagram accounts. They are Sascha, Adeline and Christine. If you would like to read about my last Kommatia pattern testing project which is a super v-neck jersey top, you can click here. 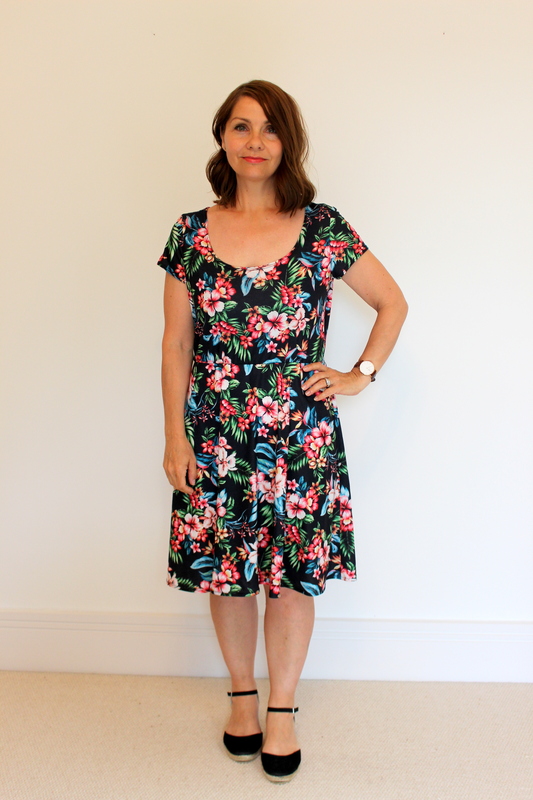 I am having fun writing blog posts for the Minerva Crafts Blogger Network, and this months make is a pretty Christine Haynes Emery dress made with a skirt alteration from gathers to pleats. I used a fabulous Seashore cotton poplin and if you would like to read the full review you can head on over here , where you will of course find the links to all the supplies that I used for this project. Thank you Minerva Crafts ! 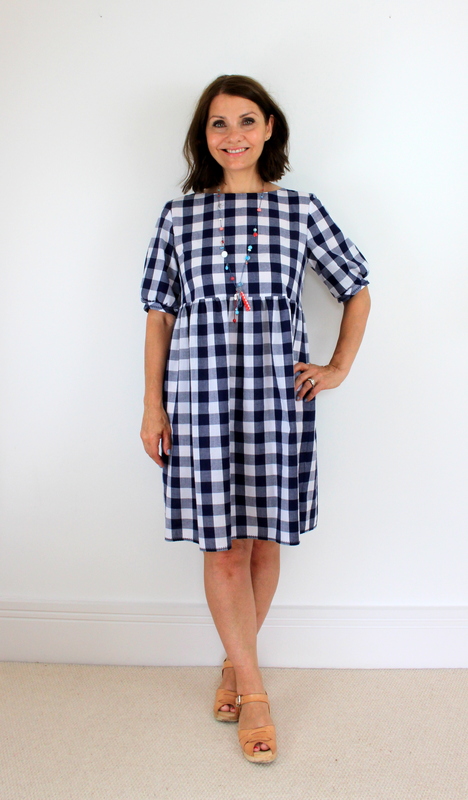 I am so happy to share with you my latest make, McCalls M7313, which is a great little skater dress for knit fabrics. 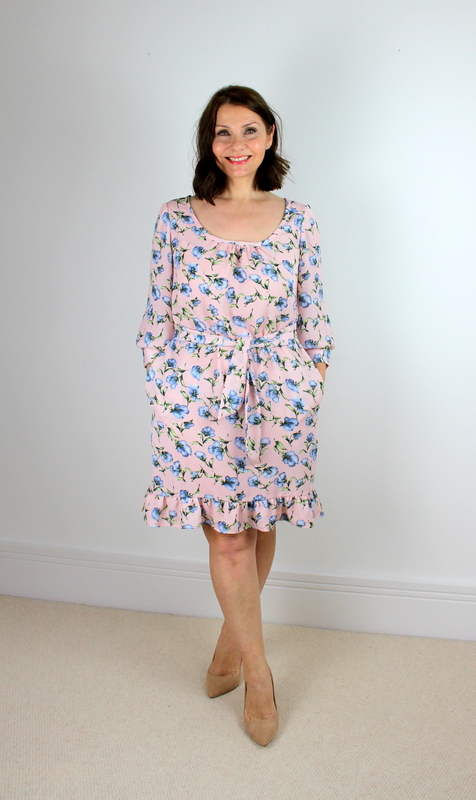 Writing this blog has opened up some wonderful opportunities for me, and I am lucky enough to have been given this stunning fabric and sewing pattern by Lucy and the team at Sewessential. Lucy, her husband and her Mother in Law, all work together to run this successful online sewing superstore, which started about 13 years ago. Over the years it has grown and not only does it offer you the most beautiful range of fabrics, it stocks the most enormous selection of sewing patterns. Furthermore, I was surprised to see a vast range of haberdashery and sewing gadgets and I was blown away by the choice of sewing machines and overlockers. For those interested I use a Janome sewing machine and overlocker. Clearly it was going to take some time to choose a pattern and fabric that I wanted to work with, and it did! I knew that I wanted to make a jersey dress. 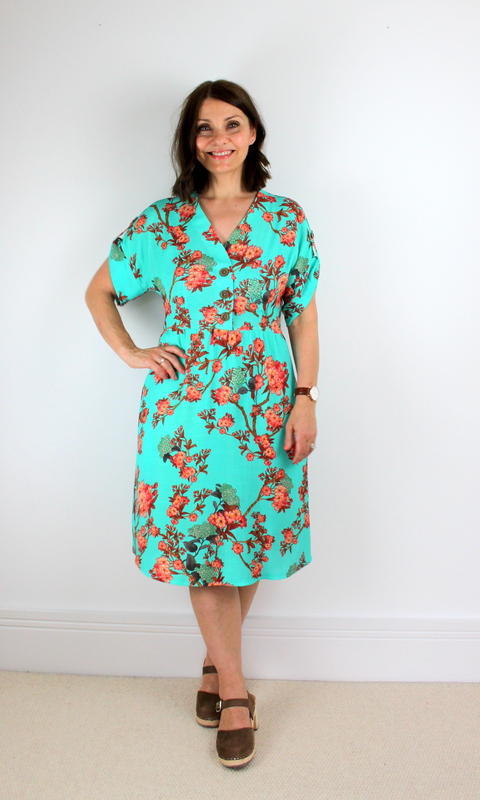 I have loved making several versions of the Colette Patterns ‘Moneta’ Dress, and I adore a dress with a gathered waist, but I have wanted to make a slightly different type of jersey knit dress for a while now, just haven’t found the right pattern. As soon as I noticed the McCalls M7313 I knew that this was the one! This skater style dress was exactly what I needed, I have never made this fit and flare style before and it looked like it could be ‘right up my street’. I was also very drawn towards this wonderful tropical jersey knit fabric, and thought they would be a perfect pairing. The fabric is lovely and wide which is always a bonus, you can purchase in 0.5 metre increments which is helpful, and it is super soft, with a lovely drape. The pattern is very versatile. It has different sleeve, neck and length variations, so there is something for everyone! I chose a scoop neck, short sleeved version in the shorter length, but this dress would work very nicely in the Winter months with long sleeves and the high neck. Perfect! Throughout the make I used ball point pins, and a ball point needle and twin needle on my machine. It is important to use needles and pins with rounded tips to ensure they pierce through the fabric without damaging the individual fibres. I also used my sewing machine entirely for this project, proving that you don’t have to have an overlocker to work with knit fabrics! The dress came together really quickly, and I love how it has turned out. I finished the neckline and sleeves using a twin needle as I think this gives you a really professional look with very little effort! The pattern instructions are clear and easy to follow as you would expect from a McCalls pattern, and it is suitable for beginners, so is lovely and straightforward. A small amount of 1/4″ elastic is needed to give the waistline a tiny bit of shape, but no zips, darts etc make this a pleasure to make. Aren’t dresses that you can just throw over your head the best! I can imagine this dress on a sunny day out worn with wedges and sunglasses, but would totally wear it on a cooler day with a denim jacket and ankle boots. That’s the British Summer weather covered! Pop on a belt to dress it up a little! I have really enjoyed making this dress, and would like to thank all at Sewessential for the supplies. It will certainly be a dress I will wear all Summer and I already have plans for another one as I want it in all the colours! Thank you for reading, have you made this dress? I would love to hear from you. Simplicity 1108 Kimono Sewing Pattern Review. Some lovely sunny weather here in the U.K lately has really put me in the mood for Summer. 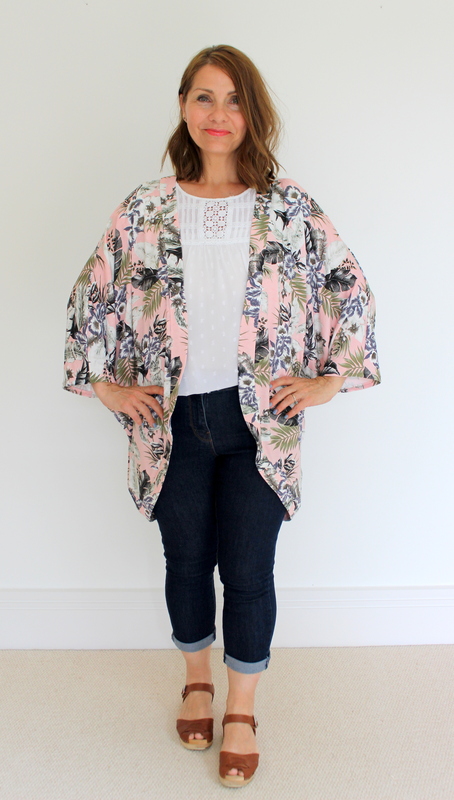 I feel that a kimono is a really useful part of my Summer wardrobe, I own several and have made a couple ( if you are interested to see my review of another Simplicity kimono please click here). However, as we all know the British weather can be unpredictable. 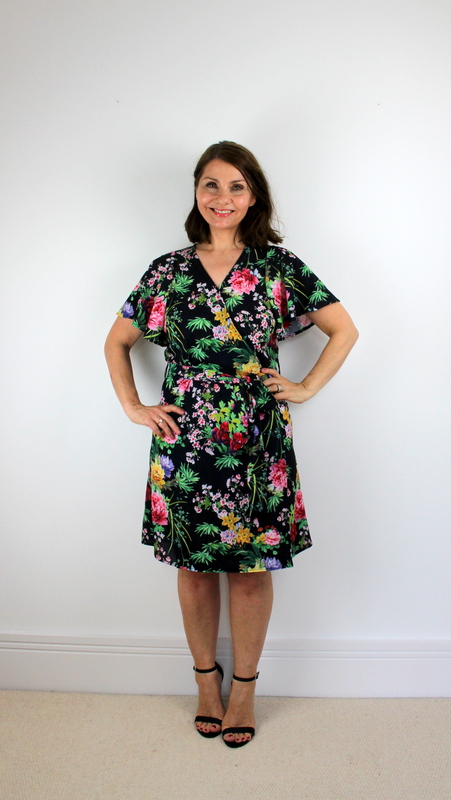 So when I spotted this Simplicity 1108 kimono pattern which was the free gift in this months Sew magazine, I decided that I wanted to make it up in a cosy tropical jersey fabric. I am then covered (literally) if the temperature drops, but the tropical print still gives out the Summer vibe. The fabric I chose is a really cheap jersey from the ‘£1 a metre’ stall at Leicester market. You can really pick up some bargains from this stall, but it is not there every day, I think I was there on a Thursday and happened to catch him that day. I only wanted 2 or 3 metres but he ‘threw in the rest’ and I probably ended up with 5 metres of it for £3. What a bargain! Beware – as a result you will be seeing lots more makes with this fabric! Just a note here to mention that I used ballpoint pins on this project, and the ballpoint needle and twin needle on my sewing machine. It is important to use these when working with jersey as the rounded tips of the pins and needles glide through the fabric rather than cutting through it. The pattern has several different options – short, medium or long length, and with or without the trim/band. I decided to go for view B, which on the pattern cover is the image on the bottom right corner. Cutting out was straightforward as it is basically 2 x front pieces, 2 x back pieces and the pieces to make the band. Take your time when constructing the band and the band facing. It is easy to make an error here if you are not careful. Use the pattern notches to make sure your pieces are correctly placed together. The band, when constructed, is basically a curved piece of fabric which attaches to the entire opening of the kimono. When attached, the seam allowances are clipped and the band facing is then attached to this. The seam allowances of the band facing then need clipping. All this snipping took me SUCH a long time, but it is worth it as the facing will lay nice and flat if you clip it thoroughly. Interfacing is required for the band pieces, and this was the first time that I had used a knit interfacing. I had no problems with it, it was iron-on and did the job great! 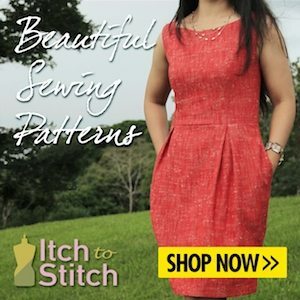 A cute feature on this pattern is a small gathered section just at the back of the neck. I decided to use the ‘cord’ method of gathering on this project – this is where you place a cord along the length you want to gather, then simply zig zag over the top taking care not to catch the cord with the zig zag stitches. Simply pull the cord to easily gather your fabric. I have seen this done using dental floss as the cord – I had some thick cotton cord in my sewing basket and used that – it worked great and allowed quite a chunky fabric to gather easily and smoothly. I will definitely be using this technique again! This shows the gathers at the back of the neck before and after they are pulled. Note the zig zag stitches ‘straddle’ the cord. I’m pretty pleased with how the kimono came out. I feel that the shorter version may have suited me better as I think this is a little long for me, but hey ho! never mind – I will still enjoy wearing it on those cooler Summer days and it will just keep me extra warm! I should also mention that it does sew up a little on the large side. I understand from other reviews that this is how it is supposed to be, but you may want to take this into consideration when choosing your size. It’s a great pattern, with a size range from XXS-XXL. Sew magazine issue 99, July 2017, (which is still current at the time of posting this), has helpful hints and tips on fabric choices, tools, sizing advice etc. ‘ Yours truly’ also gets a mention in the magazine on page 37 where they announce the results of the Dressmaker of the Year competition. I won first place in the ‘ready to wear’ category, and will be writing a blog post on this soon. I hope this review has been helpful, have you made a kimono recently? Have you used jersey? Do let me know how you got on as I love to read your comments.